Drawing from resilience ecology, in this talk I will propose that we are entering the Anthropocene’s ‘back loop,’ a time of release, fragmentation, and reorientation in which not only populations and climates are being upended but also physical and metaphysical grounds. In response to these dislocations, coastal cities are increasingly cast as climate change first responders: both ‘front lines’ where uncertain futures are unfolding and ‘laboratories’ in which experimental practices and technologies of resilience are being tested out and new sociotechnical assemblages being conjured. How do we understand these transformations? How are such practices transforming the meaning and scope of the urban, its life and politics? I take up these questions via research on what I call ‘back loop urbanism’ here in Miami, Florida, where a variety of local, in situ, experimental urban resilience efforts are underway. 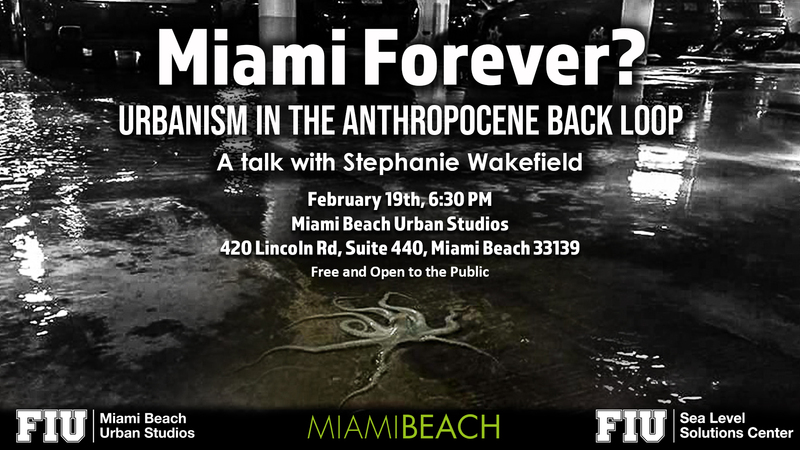 From nature-as-infrastructure attempts to increase natural water flows to the Everglades, maintaining freshwater pressure against the seas, and diverse efforts by art and municipal institutions to reimagine the city’s watery futures, to informal adaptive practices of working class communities living in and with disrupted environments: emerging in Miami is an array of distinct back loop techniques that fold in local trajectories and legacies in unique and sometimes conflicting ways. While I will touch on each individually, I am interested in how they are drawn together as an ‘assemblage’ of back loop urbanism, in which the city itself —its forms of life, self-conception, and material composition— is being reimagined and redesigned. What tools might such experiments offer, and what tools are needed, for living in Miami’s aqua-urban future?